“Think of a city and what comes to mind? Its streets”. The oft-quoted words of Jane Jacobs from her book, The Death and Life of Great American Cities ring true even in 2013. Throughout time, there have been key urbanists who are not satisfied with municipal jobs, tucked away from the citizens. These are the urban superheros. The almost mythic figures like Jacobs or William Whyte who intimately know our cities. A little over a year ago, we blogged about an exciting new project to honour these thinkers’ legacies. We put their methods into action in novel and exciting ways. We study the bicycle users' intricacies on a greater scale than ever before. Enter a simple video camera, an ordinary intersection, and more than 16,000 bicycle users. “The Bicycle Choreography of an Urban Intersection—an anthropological study” was born. Over 200 hours were logged by anthropologist Agnete Suhr as she studied 12 hours of video footage from our camera’s vantage point above two streets: Godthåbsvej and Nordre Fasanvej. Pedro Madruga logged hundreds of his own hours making sense of the raw data. The result? A delicious mélange of anthropological observation, video ethnography, and quantitative sense-making. There is something ground-breaking here. It is one thing to advocate for people-centered planning. Quite another to get our hands dirty and investigate methods to better accomplish this feat. We classify and categorize the bicycle users’ “desire lines” throughout the intersection. Where they go, but also how they get there. Are bicycle users really the two-wheeled tyrants that popular media and common conceptions pin them as? Yup. We’re closing up shop…Just kidding. Three major “types” of bicycle users emerge, separating the steady stream of bicycles into a diverse and differentiated bunch. Each “type” uses the urban theater differently, like the people William Whyte captures on film in the plaza of the Seagram Building in New York City. Now, in this three part series, we are proud to present you with the study’s most pertinent findings. Stay tuned for the full document’s unveiling in the last segment. This is no fancifully-designed paperweight. We hope that traffic engineers, city planners, flaneurs of all sorts, urban fanciers, and elected officials alike will take interest and make our ‘Copenhagenize Fixes’ a reality. Let’s begin with what we’ve learned about the users’ behaviours through the intersection. The next edition describes the results of the “number crunching” that came out of studying all these choices and so-called “rule-breaking” behaviours. Our final words cover the infrastructure improvements that we believe will work with these users’ movements and truly transform planners’ prioritization of urban space. So let’s dive in…What interested us most after hours in front of the video screen? What was remarkable or noteworthy? We focus on bicycle users, but the full document reports on all who were in the road that spring day. Desire lines. The footsteps (or wheel rotations) marking movements outside of the mainstream, pre-decided paths. French philosopher, Gaston Bachelard coined the term ‘desire paths’ in 1958. We pay homage to Bachelard and the urban visionary Michel de Certeau by spotting these fleeting desire lines. 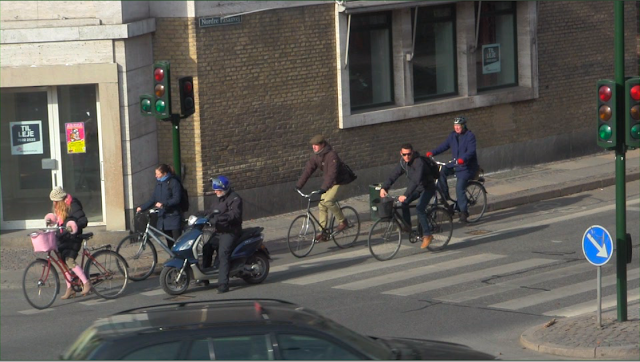 When stepping outside of the “normal” movements, it was fascinating to watch when bicycle users’ posture shifted. Tiny changes that help facilitate communication amongst other road users. Look for them while you walk or ride. Occasionally, bicycle users needed to cut through pedestrian crosswalks to change routes. They would either stay on their bicycle, “scoot” along with one foot on the pedal while the other pushes off from the asphalt, or hop off entirely and walk across. In choosing the one of the first two options, the bicycle user sits straighter, glances around more frequently, and generally makes his or her presence known. They resume their normal position once they are again in the cycle-only space. We do not advocate the willy-nilly mixing of road users, yet these small encounters show the lack of drama between pedestrians and bicycle users. They communicate with subtle body language and voila! Safe passage for all. The tape showed no events of angry pedestrians cursing at bicycle users, or similar over-the-top encounters that have become the anti-bike, apocalyptic visions of so many hesitant to embrace bicycles in city streets. 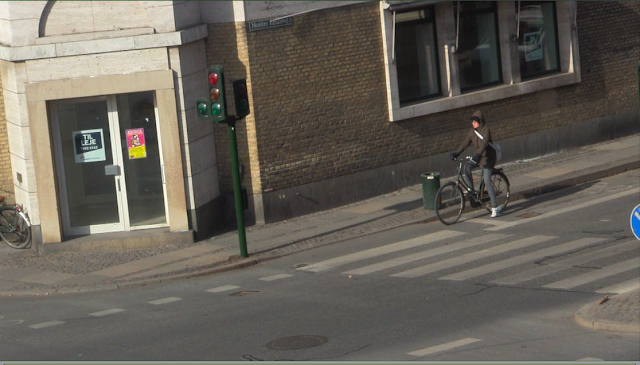 Conflicts do occur--and Copenhagen could do a lot more to treat pedestrians with the same level of courtesy that they do cyclists—but our video ethnography revealed no such occurrences. Pedestrians continuously entered the crossings from the very edges or off the white stripes entirely. As they crossed, sometimes their paths curved in the center, so that they walked in the middle of the stripe by the time they reached the road’s center. Movement throughout city space is a funny thing because users act according to their own wishes, yet these choices are influenced by others’ movements and choices. We observed this “follow the leader” spirit when bicycle users chose to wait either before or after the stop line at traffic signals. Time after time again, we saw the first person at a light set the precedent for the cyclists who joined them there. If one waited in front of the stop line—while making a box turn, say—rather than the customary position behind the line, small bicycle packs formed nearer this ‘first mover’. If the first mover positioned themselves behind the line, the bicycles who joined them at the light frequently waited behind the light as well, instead of going past the line. Like the “scooting” cyclist we discuss above, these bicycle users are (perhaps unbeknownst to them) using subtle body language to coexist together. It is fascinating to watch how their movements relate to one another and how their paths intertwine in surprising ways. Try it next time. Note where you stop and let us know. 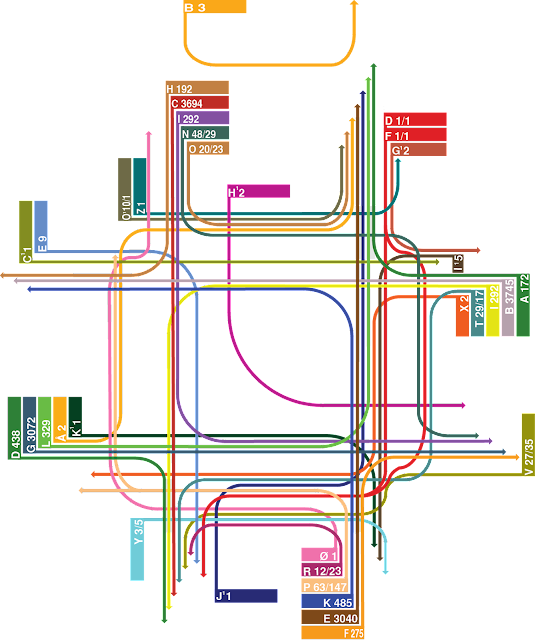 Are these behavior patterns similar in other cities or not? If one bike stopped at a red light starts to “crawl” forward at a light to roll past the stop line, do others follow? Our own observations saw others “crawl” forward as well. Fascinating fodder for any number of other urban experiments. Our office has ridden bicycles in 70 cities around the world. It is an understatement to say we are confident in Copenhageners' well-behaved bicycle behaviour. Having the infrastructure to follow, means they will stick to these paths. No surprise here! 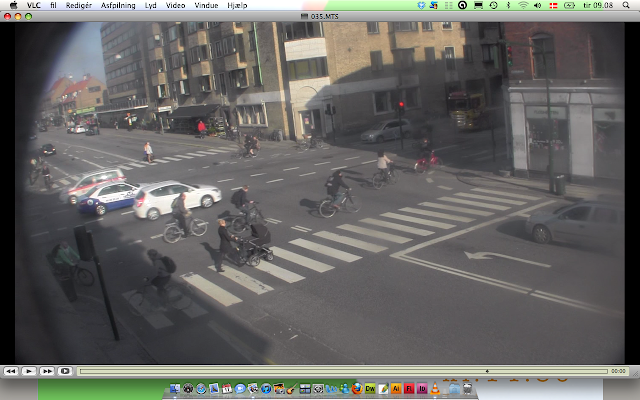 So who are these mysterious Citizen Cyclists making their way around Copenhagen? We’ve devoted our work to catering to their needs, telling their stories in the cities where we ride, and generally trying to export their experiences elsewhere. So it makes sense to take an “up-close and personal” glance into how they travel. “Those damn cyclists!” as it turns out, are much more heterogeneous than the average person might think. Conformists—93% of observed users. They follow the rules. Generally very precisely. They stick to the paths laid down in front of them and follow the traffic signals and road markings how they were intended to be used. Even if the rules governing cyclists were mainly car-centric in origin. 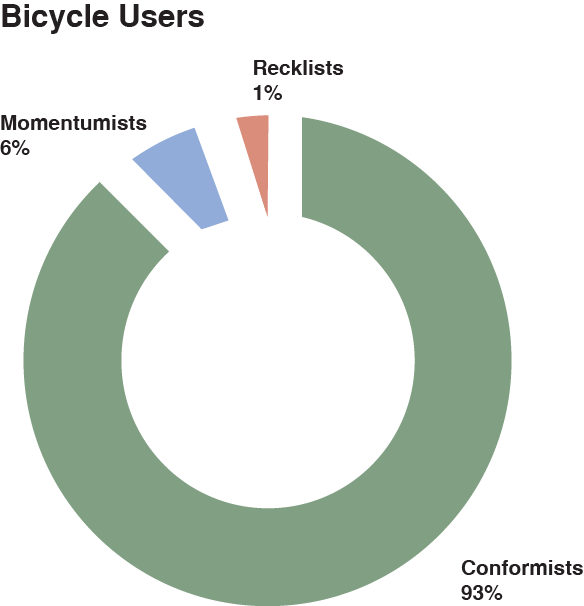 Momentumists—6% of observed users. They follow their desire to keep a steady flow and make adjustments accordingly, including turning right on red or carefully riding through a pedestrian crossing (See the above section for more on this). Recklists—1% of observed users. The original wild urban poster child for the “bad” cyclist: riding through red lights and turning left like a car. In contrast with the legal method of riding straight through an intersection, turning 90 degrees and halting at the light before continuing in the new direction. 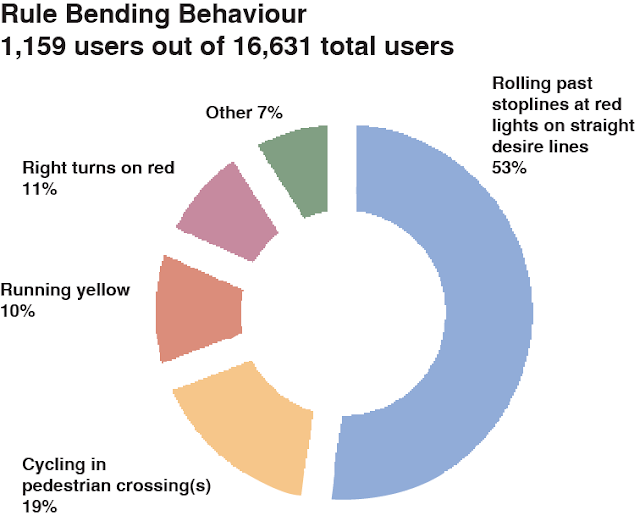 Of the rule breaking we observed, the majority (53%) occurred as bicycle users “crawled” past lines at red lights. Not so grave an infraction as some associate with urban bicyclists. The physical environment (segregated cycle infrastructure) and influence of other road users (stopping location—see previous section) combine to shape cyclist behaviour. In building bicycle culture in other cities, we can use these findings as powerful tools. They show insight into the building blocks for safe, respectful, and successful bicycle mainstreaming. Here, we take the quantitative data from the study and tell a story about our cities. A story about how to understand allegedly ‘rule-bending’ behaviour to discover how municipalities can better relate to these users and the desires of all on our roads today. We now present our “Copenhagenize Fixes”. These fixes are quite simple, but we believe, will go a long way in working with traffic behaviours, instead of policing them. The graphic above shows the following improvements to the streetscape. Each desire line is given a different letter as a label. The numbers are the number of bicycle users. Two numbers? The first is a mounted bicycle user and the second, a person walking their bike (example: through an intersection). We create a safe space for bicycle users to make U-turns, while respecting the traffic flow and infrastructure. As the diagram shows, the edges are curved to facilitate their turning movements. Since the paint follows them through the crossing, the bicycle users are protected from automobile traffic. Bicycle users roll past the stop line to distance themselves from cars. Pushing the stop line away from the bicycle users creates more space for cyclists and would probably result in more conformist behaviour, since more than 90% of bicycle users respect the existing infrastructure. Most intersections in Frederiksberg/Copenhagen come equipped with traffic signals, so adding one here closes a missing link in the city’s overall traffic design. The crosswalk edges wing out to match the places where pedestrians are most likely to enter the crossing. Throughout our observations, we noted people's tendency to enter the crosswalk from the edges of the white stripes, or step into the crosswalk from the outside of the lines entirely. The pedestrian crossing is a lower-tech version of the Ergo Crosswalk designed by Jae Min Lim that we blogged about a few years back. 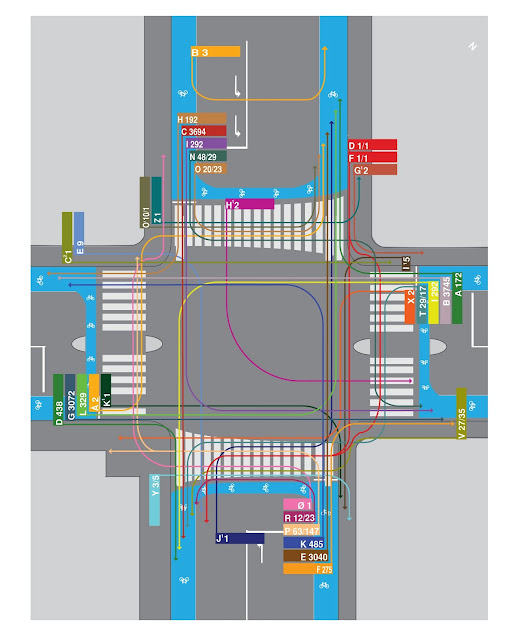 After publishing this document, we've thought more about design possibilities that would push the envelope for this intersection and others throughout the city. Another reason why the document cannot be viewed as a static product of our observations, but the tip of the planning iceberg. A path to new ideas that we will keep developing over time. So while these ideas incubate, we'll keep an eye peeled out our window and in city streets for how best to direct the choreography that blissfully surrounds us. Read here our report: "The Bicycle Choreography of an Urban Intersection: an Anthropological Study" and let us know what you think.